I visited my local creek again and rather than flooded it was well in the banks and the sun came out… the other thing that can go wrong. I should have went early morning when it was sprinkling. Still, the fish were biting. 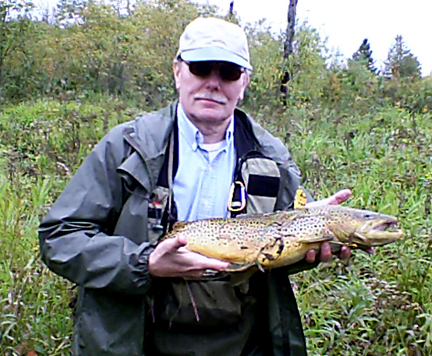 I caught five browns and one brook trout which was a nice surprise. About 16 inches. I don’t remember ever catching a brook trout on this stream but there’s no reason they shouldn’t be in there. Farther upstream they are likely common. I fish near where the creek empties into the Rogue River, where browns are dominant. I caught him at the top of a deep, sharp right-hand bend, a place almost impossible to cast. I had to negotiate over a log and step into deep water then shuffle up to the inside bank. This left only a few short underhand casts, 10 feet or so, into pockets of branches leaning into the stream. And one cast straight upstream where the water was shallow. He took the lure in the shallow water and headed to the deep bend. I had to pull back on the rod and reel quickly to keep him out of dark mess on the opposite bank. 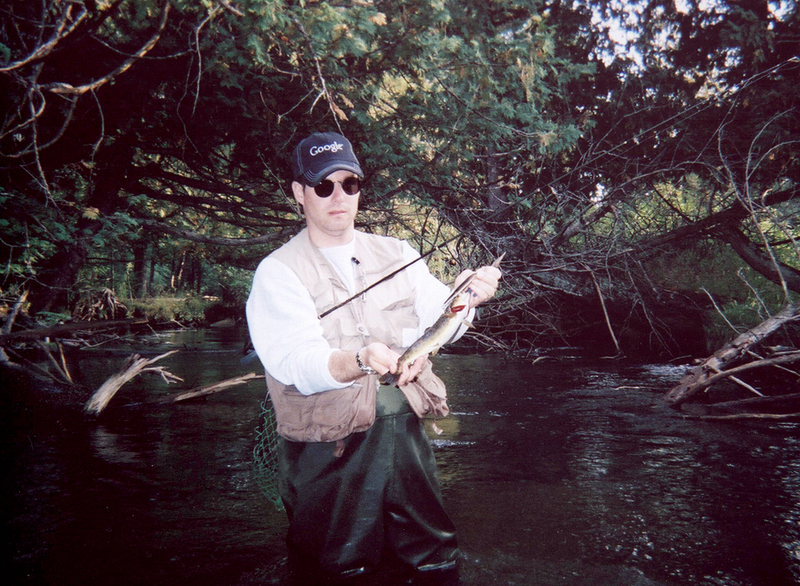 The trout was hooked good and I was stuck in the stream where it was impossible to get out. I would have liked to set him on the bank for a nice photo but I could see nettles. I unhooked him with my needle-nose pliers and set him loose. I released the browns too, which were similar in size, one or two a little smaller. I only saw one “lunker” brown which made several passes at my lure but I finally had to give up on him when I snagged a branch on the opposite bank. Turned out to be a great escape from work. I do illustration work out of my house and when I get busy I often work weekends, which has been the case for about a month. So a little fishing on a Sunday afternoon was just what I needed to forget the workload and relax. A little camping soon would help too. I’ve been wanting to write about brook trout ever since I started blogging but the problem has been getting photos. Feral loaned me some of his and I found the one above which is a respectable brook trout for the water we fish. 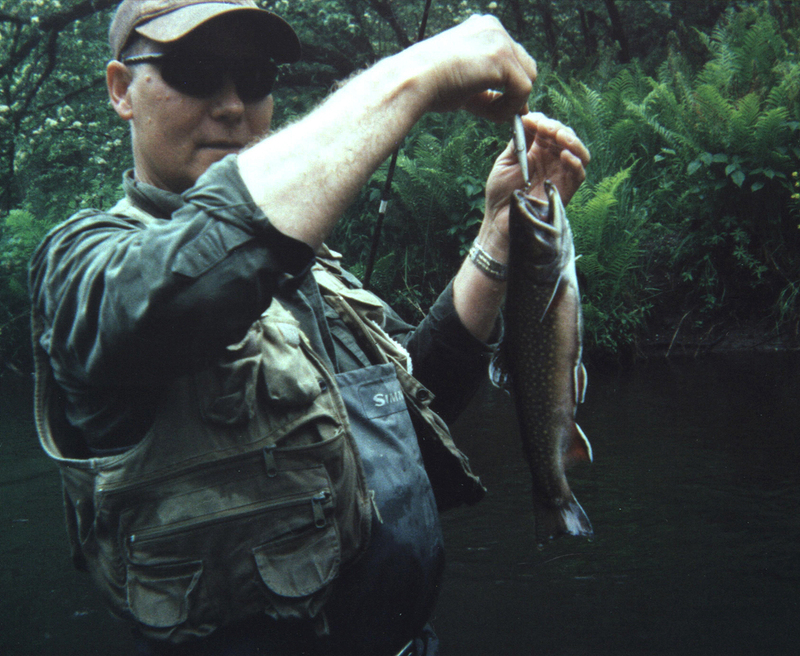 Generally speaking, brook trout reside far upstream from where we normally fish. They are more suited to the small headwaters where the water is colder. If we catch a brook trout on the lower stretches of a stream it will often be where a small feeder creek empties into a larger stream. Or where a small spring introduces cold water, sometimes trickling off a hillside. 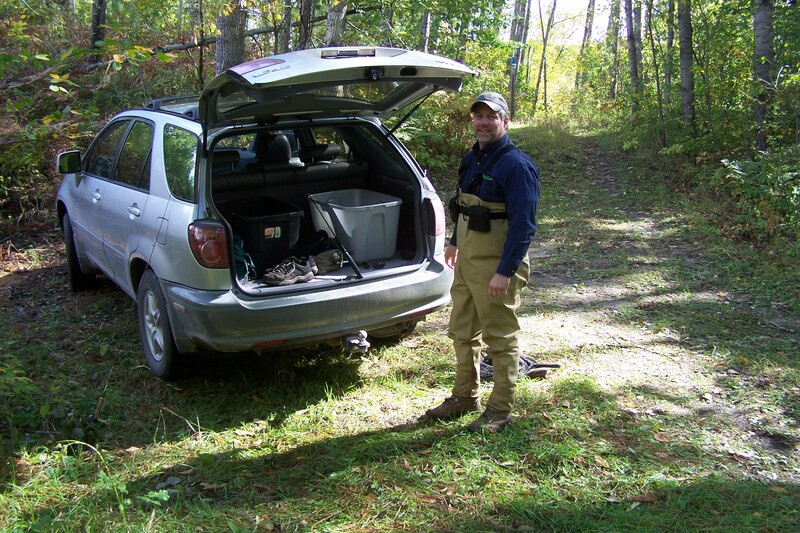 Brook trout are more aggressive and less wary than brown trout. That works against them (vs fishermen) and may be one reason browns have taken over their territory. 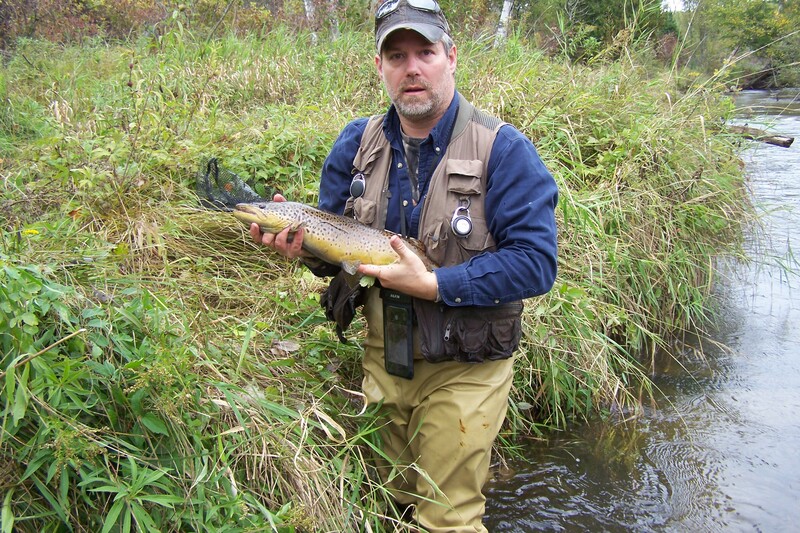 According to the Michigan DNR browns were introduced in our rivers in 1883 and say what you will, browns are great sport, run bigger, and are very abundant. That makes catching a nice brook trout all the more interesting. I probably catch one brook trout for every 20 browns. I always release them in the hopes the population will grow and I’ll see more of them. Feral releases them too. 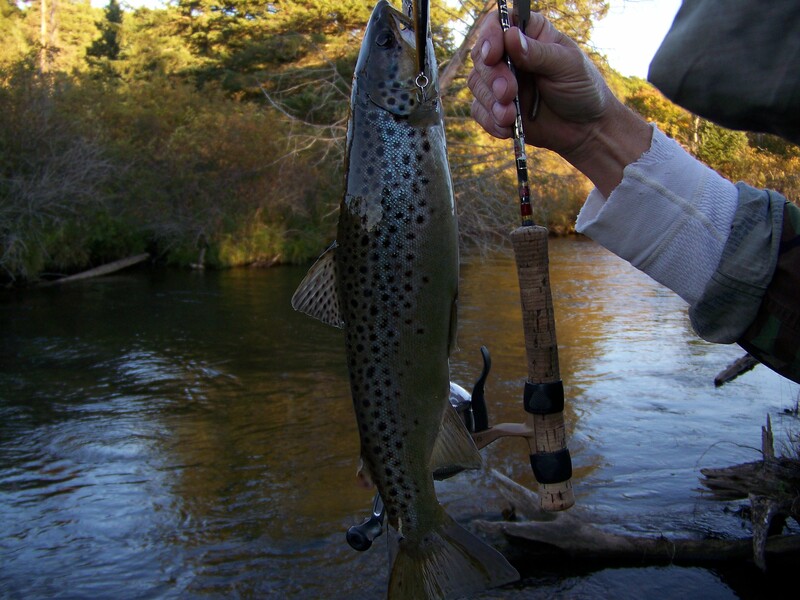 We catch brook and brown trout on the same lures: minnow baits and spinners. If we were to concentrate on catching more brook trout, small spinners with wide blades would be the way to go. Blue Fox lures in gold or silver. Wider blade means more “hang time.” In effect, the trout have more time to see and catch the lures. 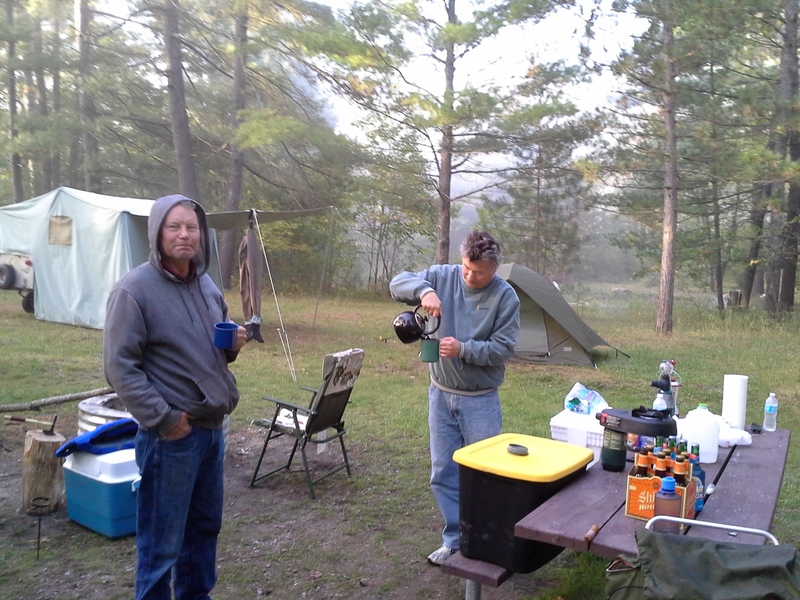 Mike and Denny, two trout camp regulars, often fish the Black River in the fall for brook trout. The Black angles through the Pigeon River State Game Area up near Vanderbilt. I fished it once with Mike and the stream was overgrown with a canopy of saplings and brush. It helped to be an expert at underhand flip casting because there is no way to overhand cast a lure into the trout cover. I am sure there are open stretches without so much canopy so that is a good excuse to do some exploring. I am trying to place exactly where the above photo was taken and have concluded it is on the Pine River in Lake County. 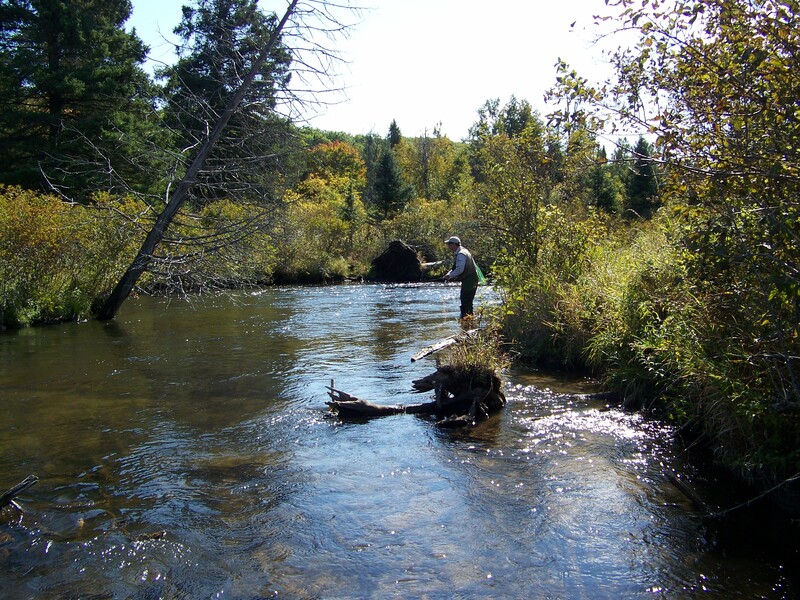 The Pine may be one of the best naturally reproducing streams in Michigan. It’s landlocked with a dam so it doesn’t get salmon or steelhead runs and that may be the clue to it’s health. We catch browns, brooks, and rainbows out of the Pine which makes it interesting. A brook trout over 14 inches is an event that deserves a cold beer back at the truck. Of course, just getting back the truck also qualifies as a beer event. Feral tailgating the S-10, Labatts in hand. The trout season came and went and I was fortunate enough to have several memorable camping/fishing trips this year with buddies that really bring something to the table – not the least a desire for adventure. For our trout season closer, Feral and I were joined by Natch first and Keith later up at Pickerel Lake which is centrally located in the Pigeon River State Game Area. Natch is a trout camp regular having put up with Feral and I for something like a dozen years – so this year we told him he has graduated to “Honorary Member 2” not the least because he outfished Feral. 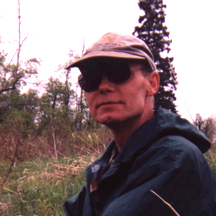 I have asked Natch to write a first hand account of his trip to the Sturgeon River on the day we set up camp where he will hopefully mention those anglers whom he admires so much and have provided so much inspiration. It would be embarrassing, but not out of the question, for me to have to edit that kind of information in to his post. As a teaser, here’s a picture of the smallest of three fish, a twenty incher, he caught on a single pass at the river. The thing about Natch and Feral is they are both game for adventure and this year it was put to a test. I won’t go into a lot of detail here – look for a post later about Dog Lake Flooding, a pike haven of some repute. If the trip in to the flooding doesn’t destroy your truck, and you don’t fall through the floating bog mass, and the whitewater and freezing rain don’t exhaust your stamina, you might catch a… OK, I have said too much already. I’ll do a post with photos. 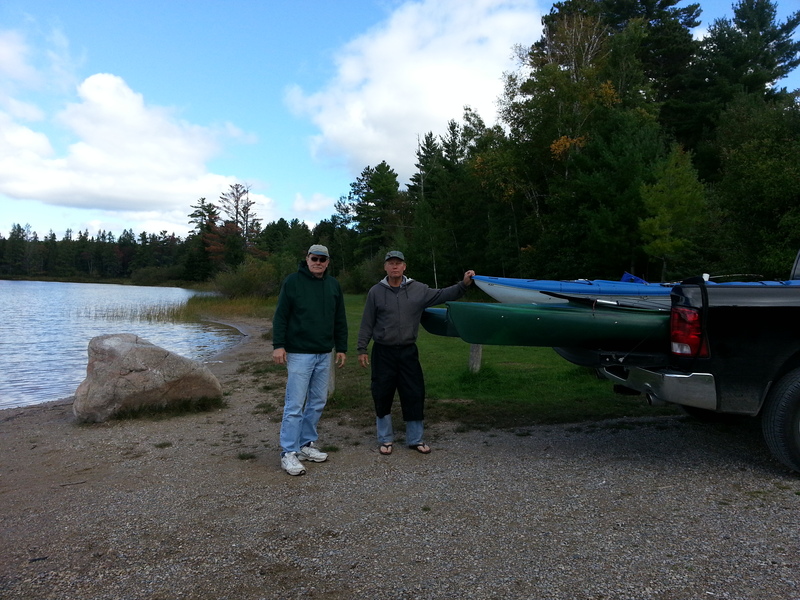 We also took the kayaks out on Pickerel Lake which was fun but not to productive. We caught a handful of bass and a couple perch but we had to work for those. Natch pulled out Sunday night and then it was up to me and Feral to prove we could still catch a trout and fortunately The Pigeon River, recently decimated by a silt fish kill by the Song of the Morning dam, still holds trout if you know where to look and when to fish. 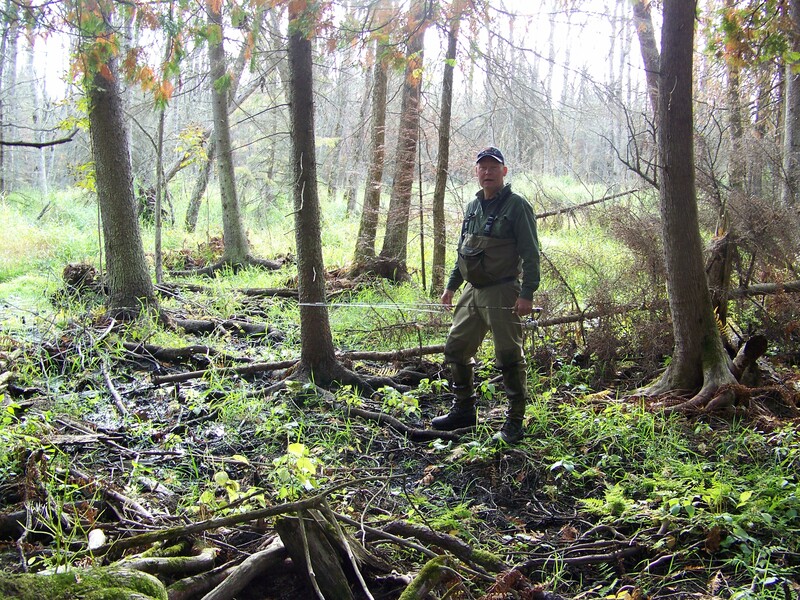 In the fall, large brown trout move upstream into the decimated area and you might believe the fish kill never happened. Feral and I took a couple big trout – but we were amazed that Feral also caught two brook trout about 10 inches. I don’t know what that means but it could be the brook trout were hardier than the browns when the dam was opened. Trout camp would not be trout camp if we didn’t play some guitar and knock down some beers over a campfire. 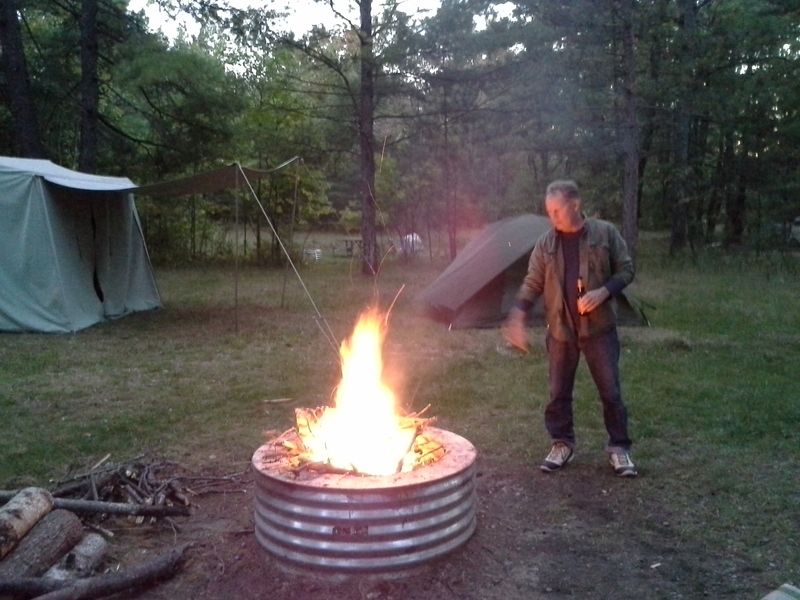 Keith, another adventurer, came up Monday for one night – which is a good four hours drive both directions for one night of camping. Somebody conk me in the head with my guitar as I didn’t get a campfire photo of Keith playing. Keith is good enough to sit in with any world-class band and add killer lead guitar and he wasn’t about to pass on the chance to play with “Rock Bottom and the Out of Tuners” which is a name unfairly placed on Feral and I by jealous contemporaries who may not realize we own an electronic tuner. We played some of our standards, like Buenos Tardes Amigo by Ween, but Keith really cooked when I started jamming the old JJ Cale song “Call me the Breeze.” Keith has some blues rock mojo and that took over. He played my old Les Paul Studio through a battery powered Roland Street Cube and rocked the campground. The other highlight was listening to him play my Martin acoustic including doing some of his own jams. A cold beer, an acoustic guitar played by a master, a warm fire… no further explanation needed. Feral lights a fire with extra virgin cooking oil. 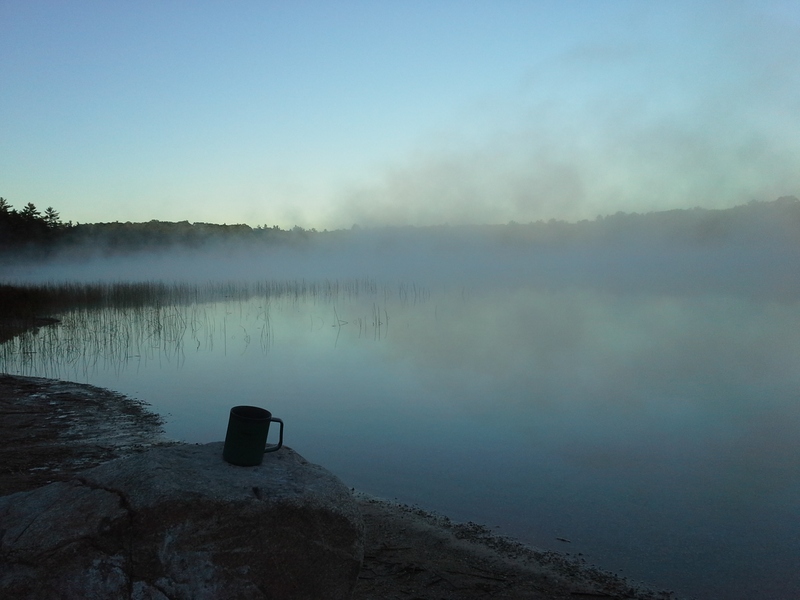 I woke up a little before them, poured a coffee, and went down to the lake and took a few photos. Another reason why camping gets in your blood. I heard an elk bugle out past the lake through the fog. 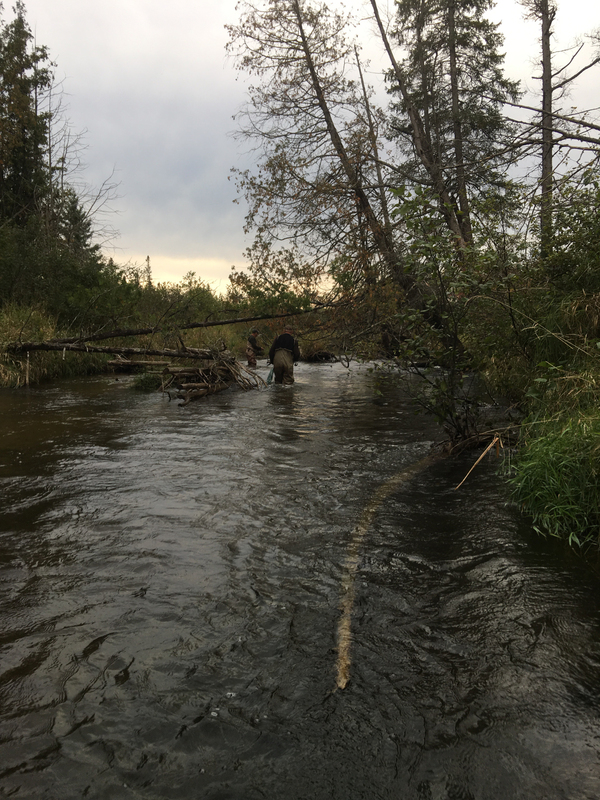 So look for some more posts on the fall camping trip to Pigeon River State Game Area: Dog Lake Flooding; Natch’s account of 3 monster browns out of the Sturgeon, and some video Feral and I took on the Pigeon with big browns. Feral and I saw a bull elk that filled a two track – half a ton? 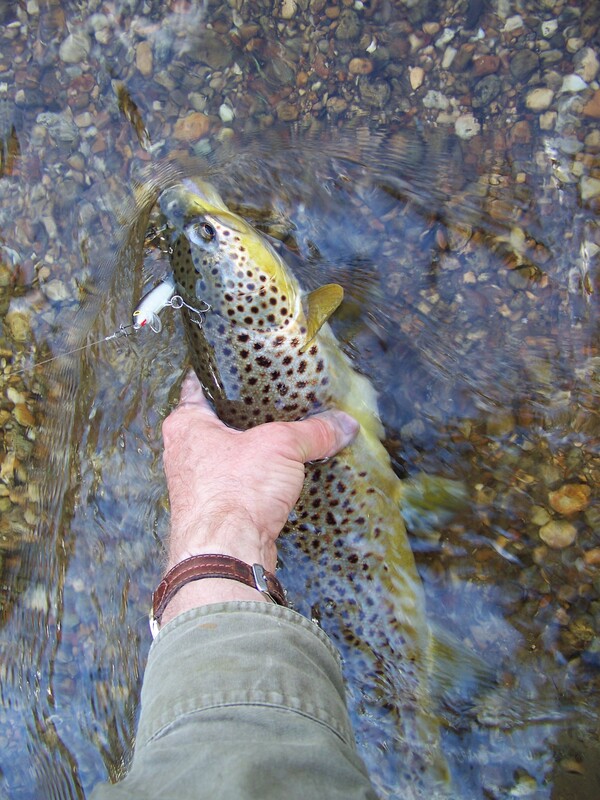 Caught two big browns following Feral – offered to take the lead! This story by Feral Tweed captures the excitement and drama of spin fishing for trout – a lone angler returns to a favorite stretch in hopes of catching a lunker he saw on his last trip. Feral’s metaphors are wonderful! – Published by permission, copyright 2011 Feral Tweed. Dawn was still two hours away as I slipped my oId pickup into gear and turned my wipers on. The memory of my previous fishing trip was still fresh on my mind. Was that a brown trout I saw breaking the surface of that deep shining pool or was it a leftover steelhead? Though I knew there were a few remaining steelhead in the stream, I was convinced, then, that it had been a large brown, and this morning I hoped to find out. If only the rain would hold out, I thought, and if only the brown is still there. 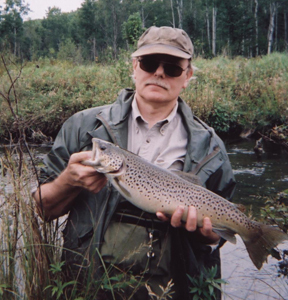 I have always been a stream fisherman but I have never caught a brown trout larger than 18 inches. If I was right about the fish I had seen in the pool last weekend, I now had a chance at a brown that must be well over the magic twenty inch mark. My headlights were getting dimmer and dimmer with each passing mud hole but I was alone on the road and could see well enough. My old metal tackle box was competing in a noisy contest with my broken exhaust pipe as I throttled my truck over the flooded two-track. I was heading to a spot on top of a large hill that overlooked a four hour stretch on the south branch of the Pine River in Alcona County. It’s still plenty dark I thought to myself as I jumped around like a circus performer trying to get into my chest waders- without putting either of my feet down on the rain soaked ground. Searching through the jumbled mass of hooks and lures that used to be my neat and orderly tackle box, I finally came up with my hand painted brook trout look-alike Rapala and couple of Mepps #2 bronze spinners. I stashed these in my breast pouch, picked up my rod and landing net, and headed down the dim leaf-covered path that led across the oak ridge and down through the cedar swamp to the stream. The sound of the rain and my beating heart was all that I could hear as I made my way through the tangled mess of blown down cedars. I had to double back several times before I finally found an opening through the mess and made my way to the swift running stream. Halting there to catch my breath, I turned to listen to the mournful cry of a great horned owl somewhere out in the darkness. Hunting for her must be tough in this rain I thought, with all the mice and ground animals snug in a nest somewhere. She probably spent most of her night gliding silently from tree to tree searching for feathered prey roosting among the branches. She’d be giving up soon, I thought. I smiled. For me the hunt was just beginning. I lit my pipe and rigged up my rod. This lure should do it, I thought as I tied a three inch Rapala securely to my new six pound test line. I don’t normally use lures this large on a brook trout stream but the spring rains should have brought the larger trout up from the main branch down below, and I was after larger trout on this trip. One trout above all, was the monster brown I had seen the week before. Slipping down into the cold black water I could see that I was about one hundred yards below the deep pool that held the monster brown on my last visit. I tossed an under hand cast up and across the stream to the opposite bank. I watched with anticipation as my lure twitched seductively on the surface of the rain dappled water, then down into the current as it came past me. Taking up my line I tossed another cast upstream that fell just three feet from the bank. 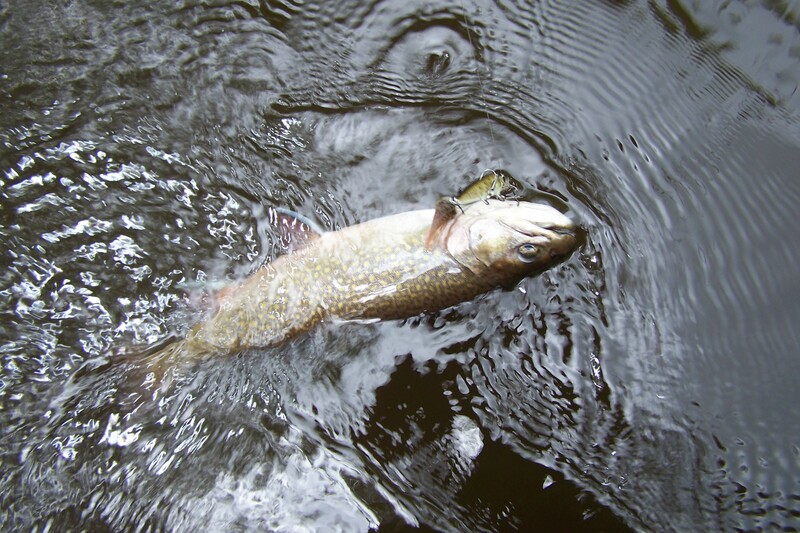 As I took up the slack in my line, my lure was smashed instantly by a nice brook trout that leaped several times into the air before I could get him under control and pull him downstream and away from the hole. The twelve inch brookie was a nice surprise. I slipped him carefully back into the water and moved slowly upstream towards the hole where I hoped to find the monster brown. I tried several more casts with no luck. Stopping below the pool I worked out my strategy. Just in front of me were two half submerged cedars lying directly across the stream. Above the cedars lay the pool with the stream turning sharply off to the right. Over to the left where the cedars struck the bank the water was close to five feet deep and the current dug down fast and deep under the tangled mass of debris left there by the spring thaw. In order to get my lure down under the jam, where I expected the monster to be, I would have to make the long cast upstream and across. Then I would have to let my lure ride the surface down along the far bank and start working it back just as it hit the jam. Hopefully it would dig down under the cover and entice the large trout out of his seemingly impenetrable hiding place. Luck was with me as I made the cast. My lure touched down easily just inches from the opposite bank, well upstream of the pool. I watched it silently as it slid downstream occasionally bumping into weeds that were hanging off the bank. A perfect cast is always rewarded, I thought to myself as I took up the slack line. Then I swung my rod out and down and watched as my lure dove beneath the surface of the water just inches in front of the log jam. I was rewarded instantly by the steady throbbing of the well tuned rapala as it shifted its course and dug down for the upstream run. Was the monster down there watching? Was he hungry after a full night of constant rain? Where is he, I wondered, as my lure came out from under the log jam. I didn’t have to wonder long. There he was sliding through the cold water like a u-boat homing in on my rapala. A shudder went through my body the instant before he struck. Then, he was on! I set the hooks hard driven by more shear panic than good judgment. I couldn’t believe the size of the monster. He didn’t run with my lure – he just rolled sideways in the current and shook his mighty head back and fourth like a large dog shaking an unlucky cat. 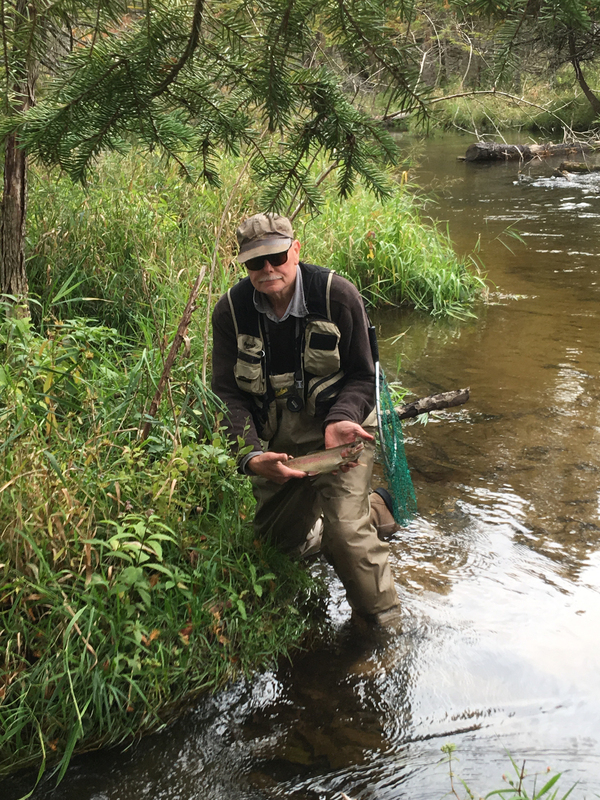 My heart was racing as I regained my senses and plunged the rod tip over the cedars and into the stream in a frenzied attempt to keep from breaking my line. Don’t go downstream, I hollered. Don’t go downstream. The brown replied swiftly by making a mad dash back across to the security of the log jam. No, no, not there either, I hollered. I could imaging all kinds of things under there he could hang himself up on. I swung my rod tip upstream to hold him and managed to get one foot over the cedars before he made a spectacular leap and hit the water on a dead run straight upstream. Shoot. I was astraddle the two cedars with neither foot on the bottom and fighting for balance and I watched in desperation as the line peeled steadily off my reel sending a spray of mist with it. Somewhere upstream I heard the monster break the surface. Freeing myself from the cedars, I plunged into the pool, all thoughts of personal safety and plain human comfort behind me. With no more than two quarts of freezing trout stream down the front of my waders I made it through the pool. Again I heard the fish leap. Cranking for all I was worth I made my way up to a straight-away that was covered over the top and two sides by thick brush. Ducking through a low tunnel, I came up to a pool below a beaver dam. There was my monster brown finning easily on a gravel bar contemplating his next move. I was perhaps twenty feet behind him waiting nervously like a bird dog on a hot point. I could see my lure hanging from his long hooked lower jaw. A large male, I thought to myself, all of twenty five inches. My landing net was fastened to a loop on the back of my waders. I would have to reach around with my left hand for it and let go of my reel in the process. I decided to take up some slack in my line first and get a little closer to the fish. That was my mistake. The moment I moved out of the opening to the deep stretch behind me the monster came to life. I half jumped out of the way as he turned and came down by me. Unable to keep a tight line on him, I watched in desperation as he went by me into the tunnel of swift moving water. For an instant I lost all contact with the fish. Fearing what I knew was going to happen, I raised my rod tip high over my head hoping I would be able to break his run without losing him. Then he was there. It all seemed to happen in slow motion. First, my rod tip plunged down from overhead splashing against the water in front of me. Then, down in the tunnel, I watched as the monster brown, framed by the overhead canopy of lush green vegetation, rose mightily from the surface against the straining line. For an instant the brown was clear of the water shaking back and forth like a John Deere at a tractor pull. Then my lure was sailing through the air and up into the brush. Instantly the monster was under the surface and gone. The stream swallowed him up as if he had never been there. I stood silently, watching as my dreams and heart were swept away in the turbulent water. Then I noticed the rain falling and heard the birds singing their morning songs in the cedars around me. I turned to face upstream and realized that I still had a three hour stretch in front of me. Who could tell, there might even be another monster brown out there waiting for me. 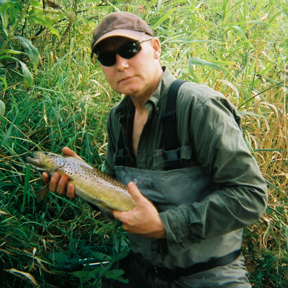 Some of the best spin fishing can be found on the small creeks eight to twelve feet wide that feed the streams made famous by the Hemingway’s of the world. They don’t get much traffic other than an occasional worm fisherman because casting is next to impossible. If you can cast and send lures horizontally into tiny pockets there is hope. Having been taught by an expert (Jake Lucas) that performed trick casting on Michigan Outdoors in the 1960’s helps in my case. Along with untold years of doing just that: casting into difficult cover. 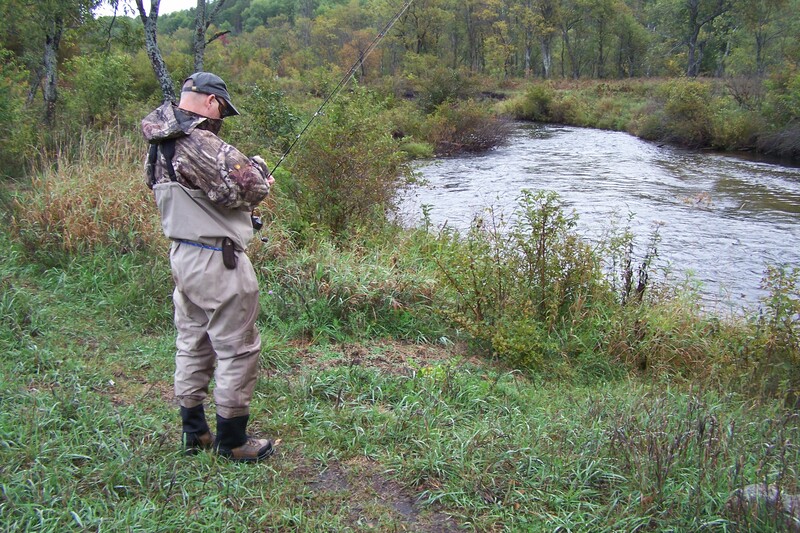 When possible, fish feeder creeks during a summer rain, enough to boil the water or at least dapple it enough so trout don’t see you standing there. 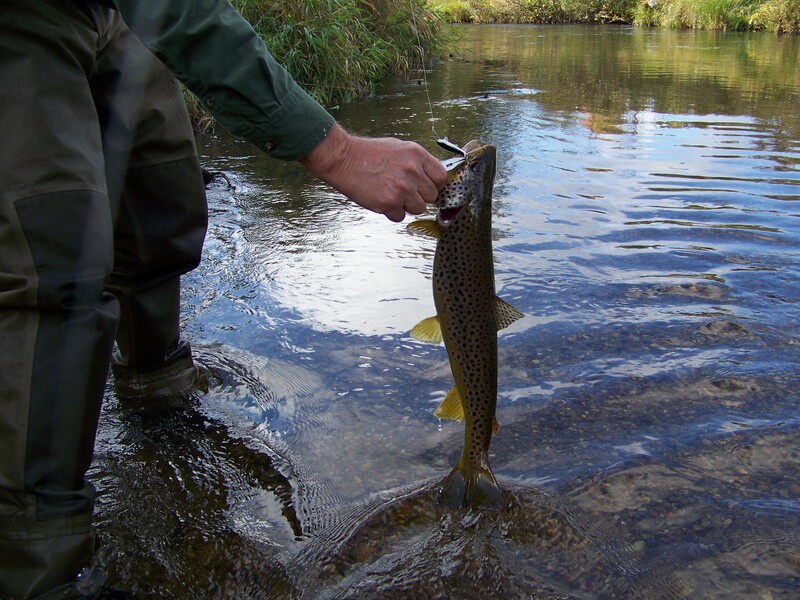 Feeder creeks come alive during a summer rain and can provide the best action you will see for the year. 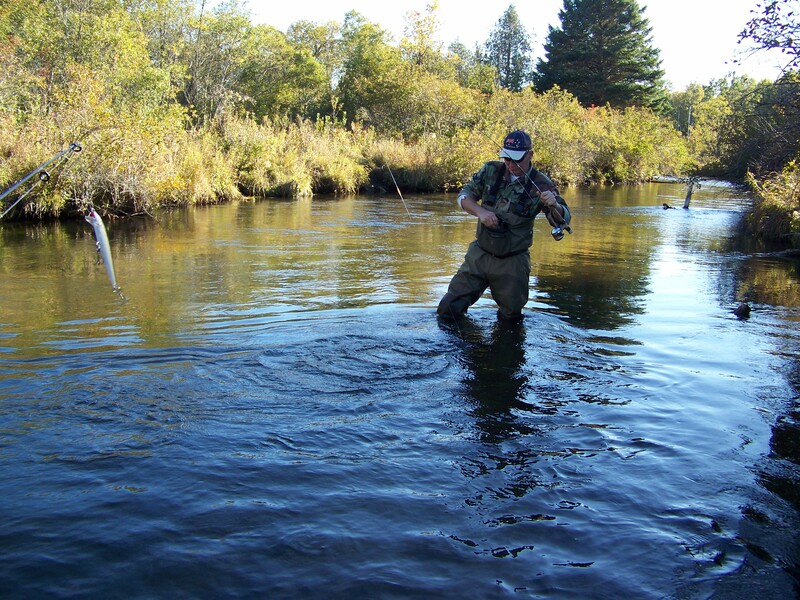 In the summer a sixteen inch fish is good, in the fall when the weather turns nasty and the closer approaches, big fish move out of the main stream and up the feeder creeks to find food. 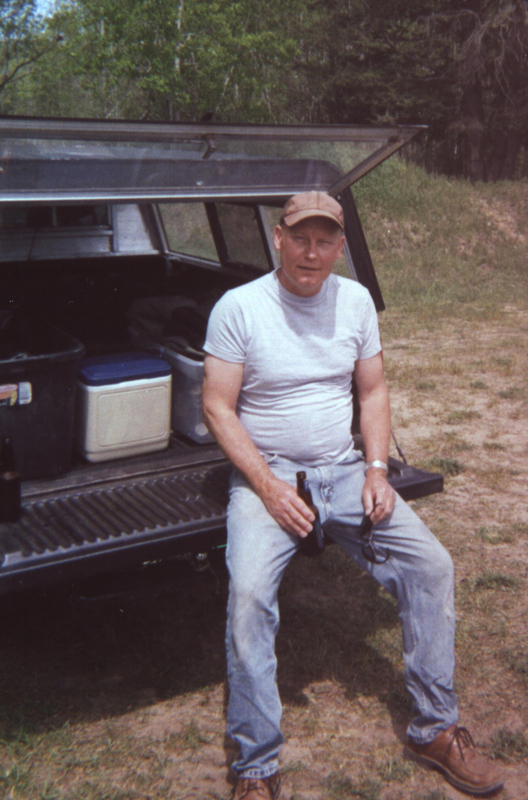 For years I travelled long distances to fish the famous and noted water during the summer and then caught my best fish of the year on a local feeder creek. In Michigan, you don’t have to drive far to find feeder creeks since major rivers crisscross the state. Rain helps but you can also do well early morning or late evening. 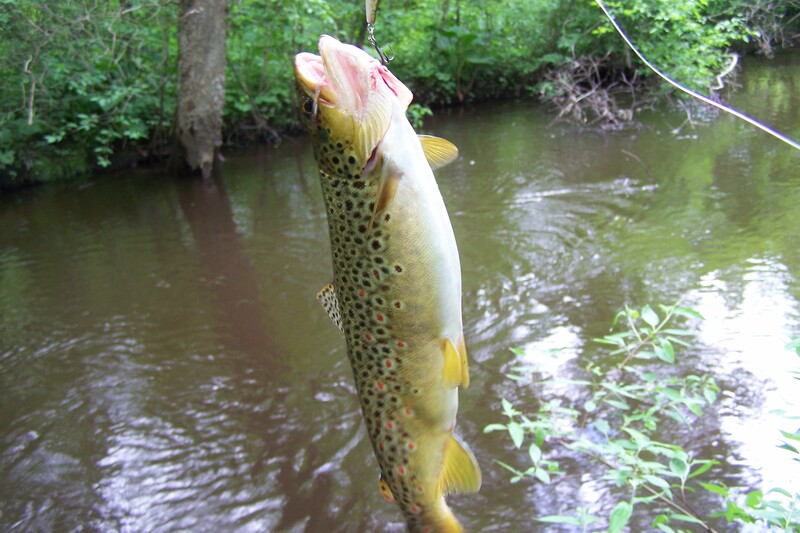 The trout are usually aggressive for any lures because the competition for food is great, and the trout are not as suspicious of lures as they are on the main rivers. They will stray away from their cover into the main stream channel for a sizable or flashy (think spinners) meal. 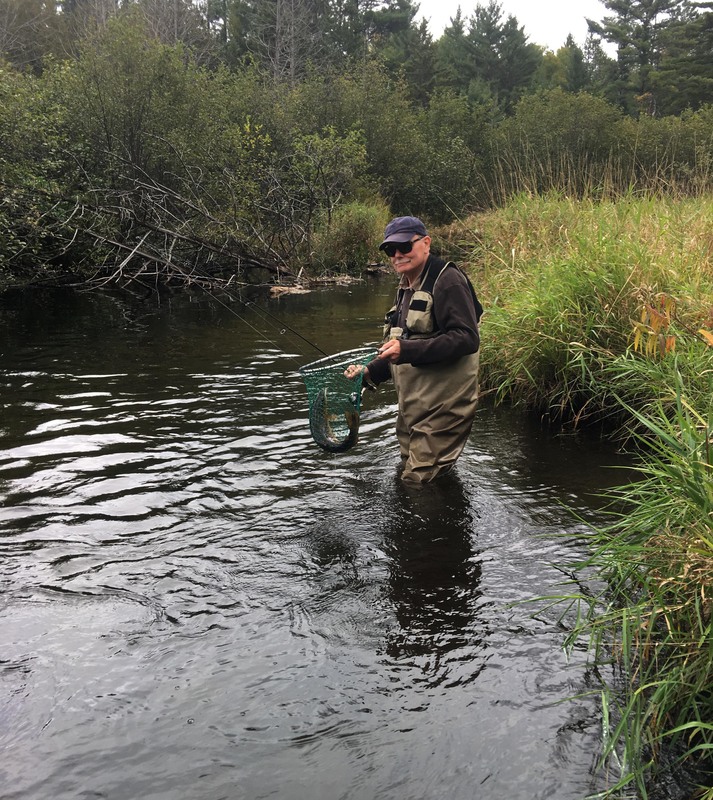 While I mainly find brown trout on feeder creeks, there is a good chance of catching brook trout the further you go upstream. 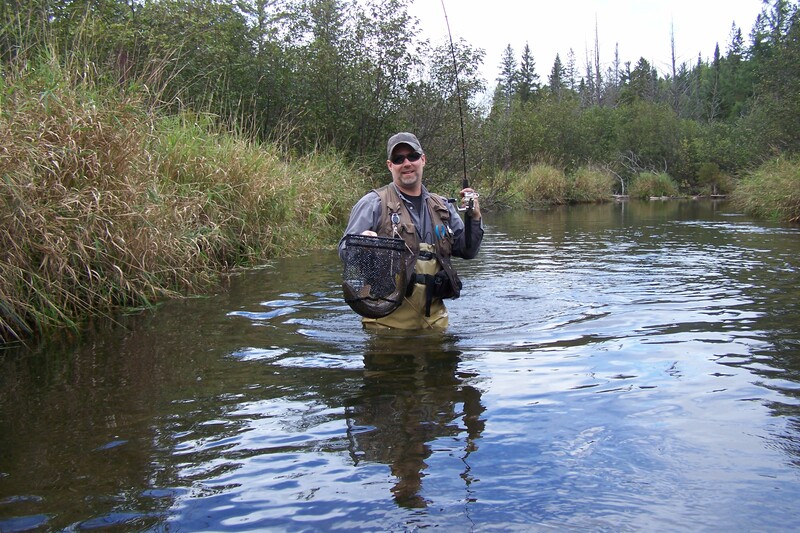 Catching a brook trout is like stepping back in time, back before the brown trout plantings and the later steelhead and salmon stocking. I don’t keep brook trout. I look them over, enjoy their beauty, and turn them back. Just seeing one is enough. I always carry a #3 Black Fury spinner with me when trout fishing. I don’t use the lure often even though I have a lot of faith in it. I’ve caught a lot of trout on this and smaller versions over the years. 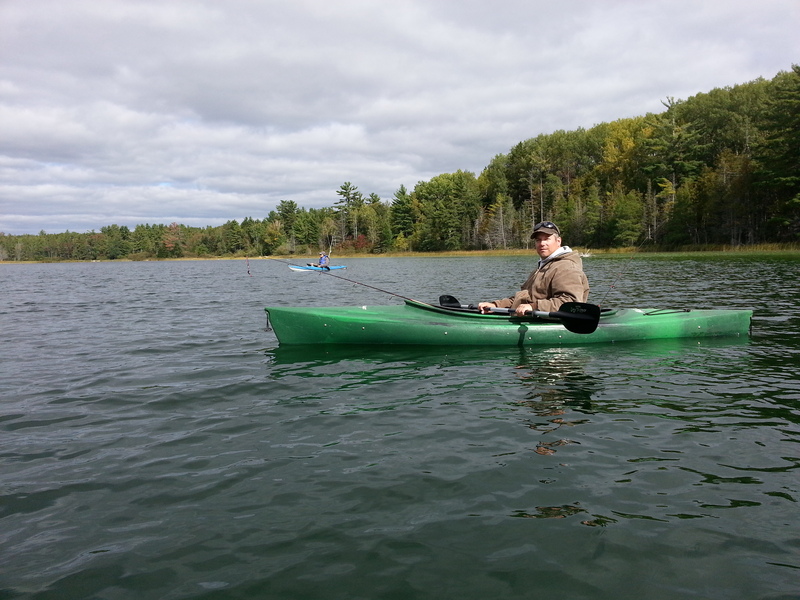 It was all I used on the Baldwin River when I first started spin fishing – it was that dependable. Now I use it when I need something magical, something that makes no sense, something the trout won’t recognize but want to attack. The stream conditions and topography have to be right. I mainly use it for deep pools and runs. If the water is stained and the stream flooded, that is a bonus. The lure sinks out of sight, down where big trout hold in deep water, and can be reeled in slow because of the large blade. There is no second guessing when a trout hits it. They smash it. 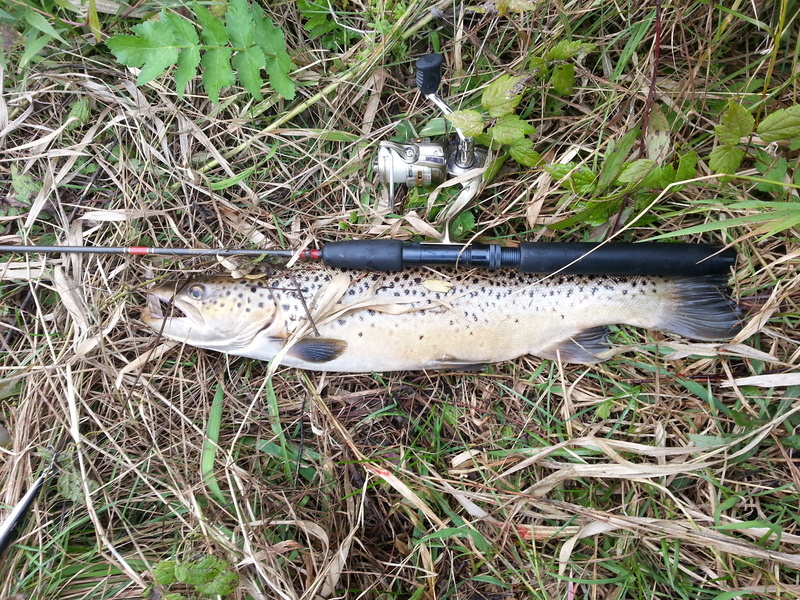 The single treble hook does its job – the trout stay on until landed. Sinking out of site means you can lose the lure on hidden logs and branches. If you do get hung up, wade upstream of the snag as far as possible to leverage it off. I also carry plain gold and silver spinners in various sizes which must look like the scales of small fish glittering in the stream. On bright days and clear streams, the glitter can entice trout out of cover even though the fish may be smallish. Mepps also makes a version with a bucktail but I prefer no tail for trout. For Pike fishing, I think a bucktails adds to the attraction. For trout I think the bucktail looks unnatural, though it is impossible to understand what they consider natural considering they attack Black Fury lures. I have no idea what this lure represents to them. These tips are gleamed from a lifetime of catching trout on Michigan streams, but by no means tell the whole story. The main missing ingredient here is pinpoint casting accuracy- getting the lure under over hanging branches and into pockets that seem impossible to cast to. Read the Close-faced Spinning Reels post for an idea of equipment, and I’ll write a post soon on how to do the Jake Lucas underhand flip cast. Master that, and you can place a cast where the big fish hide. Wade and cast upstream – they don’t see you coming. You can’t reel a lure fast enough to keep a trout from taking it. If it wants your lure it will get it. Trout like a big meal. I have caught trout the same length as the lure I was casting. 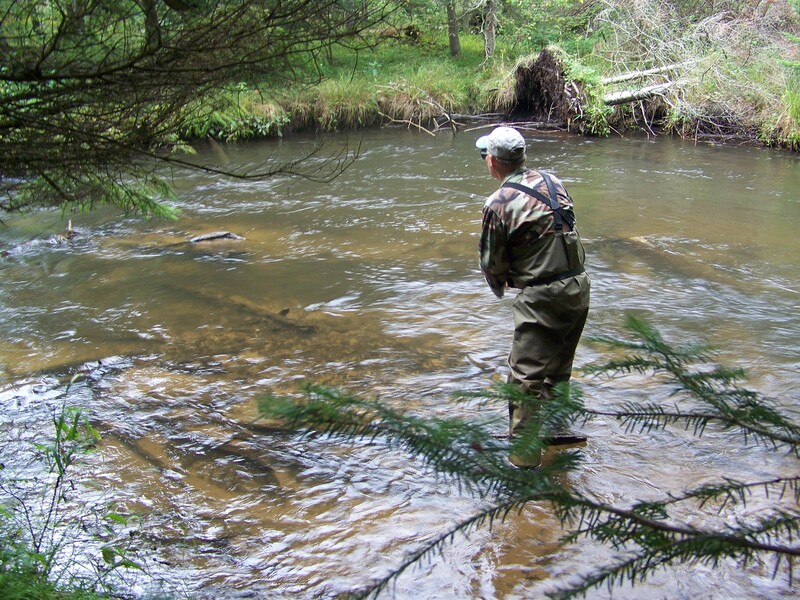 A short cast will catch trout – work the banks and cover at all angles. Fish rising rivers, the beginning of a good rain, for the most fish. 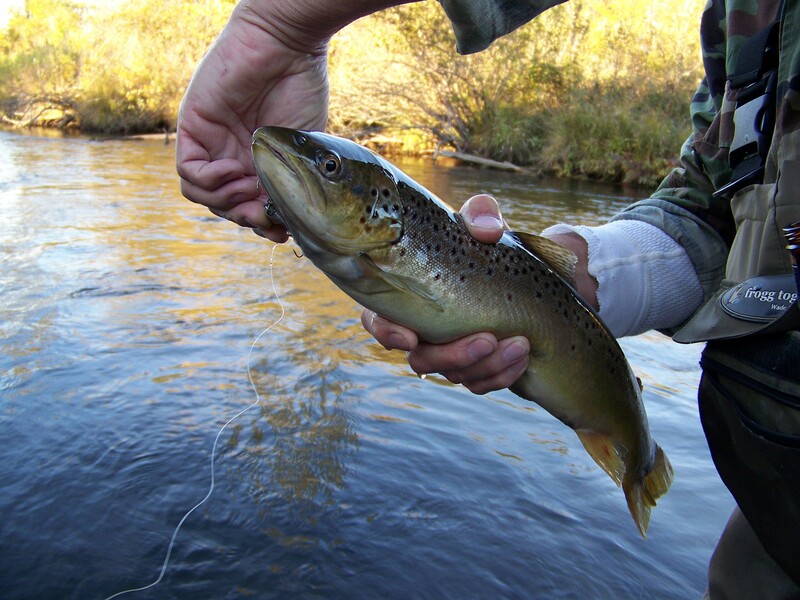 Fish late fall for the biggest fish – catch them in upper stretches of your favorite river. Try flashy spinners in muddy water and minnow baits in stained water. On bluebird days with clear streams, a trout is a bonus. Enjoy the day. Visit this site for more tips!